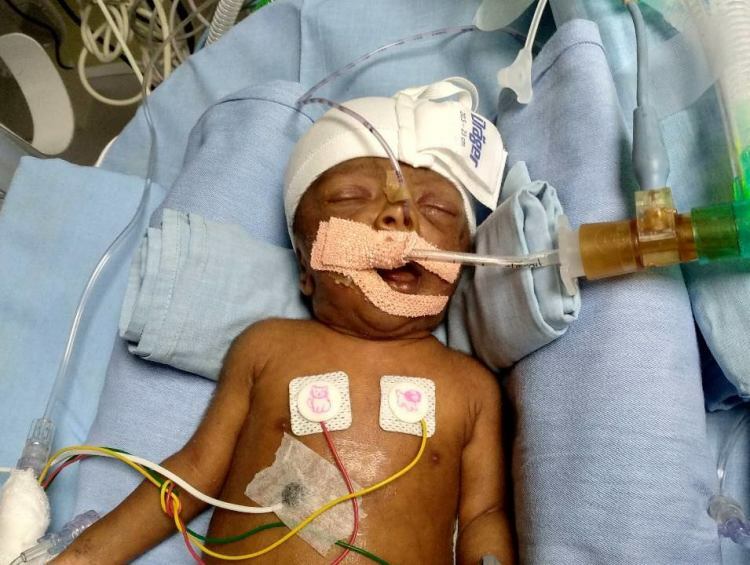 The moment your child comes to the world is usually the best moment of life, but life turned sour for Sravanti and Raju when their children were born. Their twins were born premature and have been fighting for their lives in the NICU. 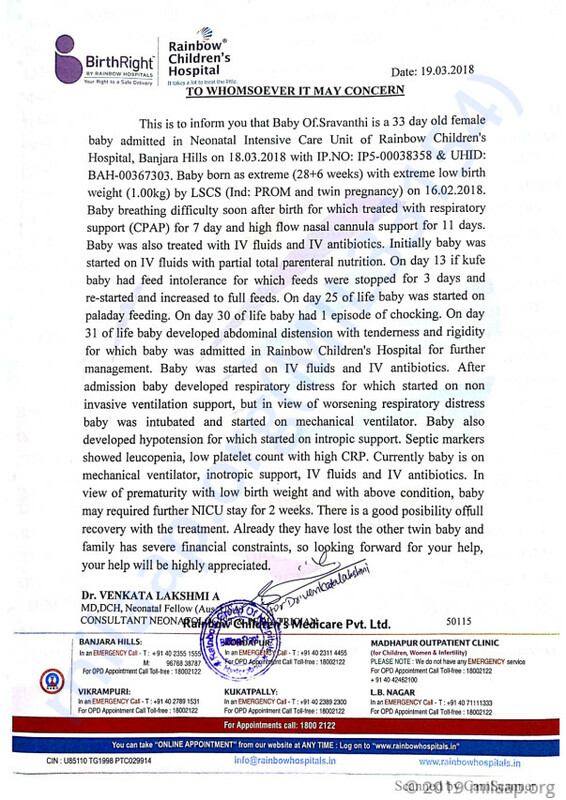 Unfortunately, their baby boy lost the battle and succumbed to death, just over two weeks later, but their little girl is still on ventilator support. 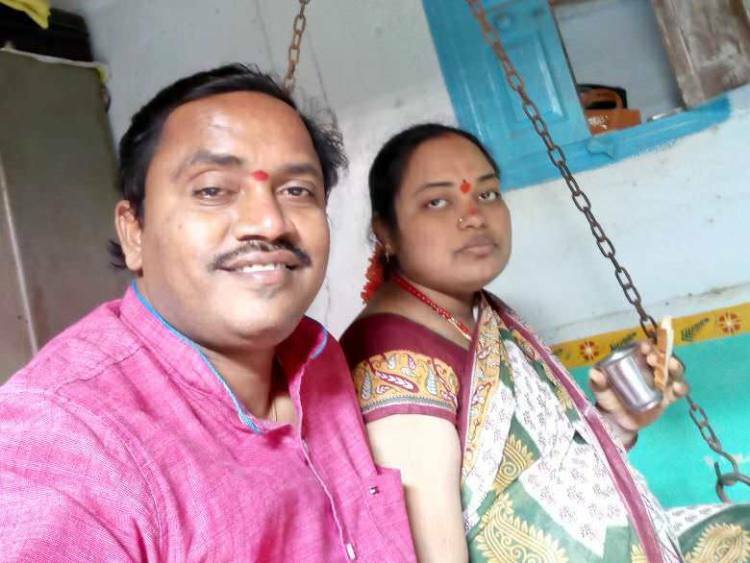 Sravanthi and Raju have been married for 11 years. When, Shravanthi finally conceived, they were overjoyed, but parenthood has not been easy for them and they have already lost one child. 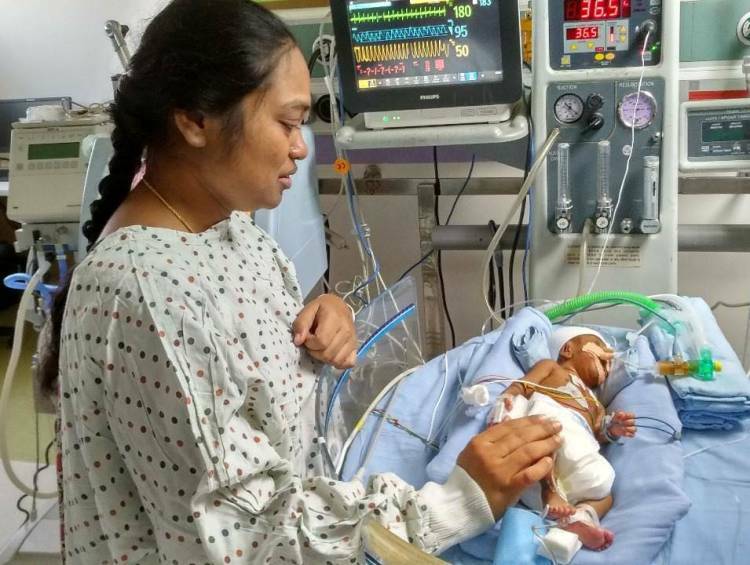 Now their baby girl, who is just 33-days-old, is in the NICU struggling even to breathe. For the desperate parents, life couldn’t have been any harder. 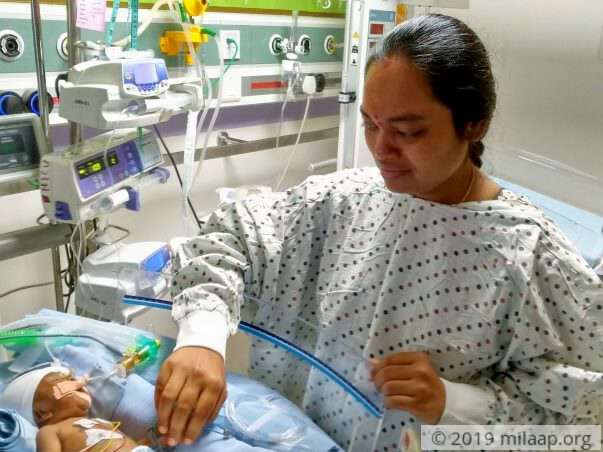 This is the second time Sravanthi got pregnant having miscarried her first baby early in her pregnancy. This time they were overjoyed that the pregnancy wasn’t complicated and that she had been able to sustain it. 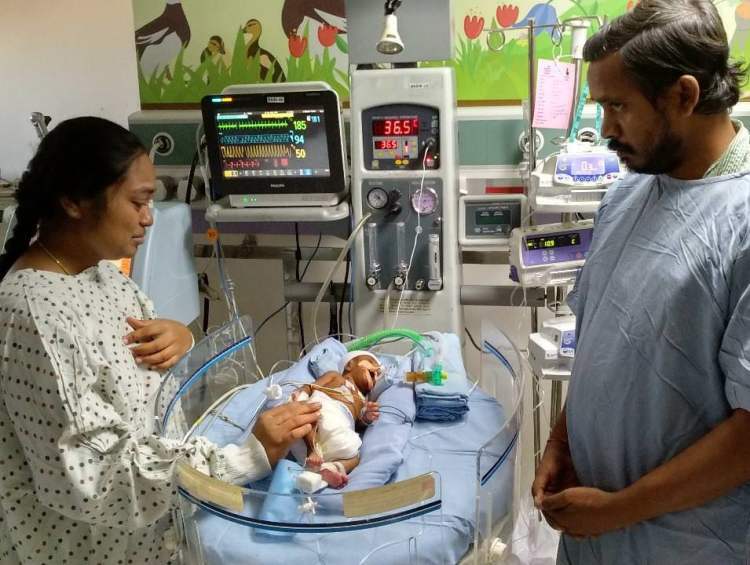 But sadly, during the seventh month, her water started leaking, putting her and her children’s life at risk and the doctors told them that she had to undergo a C-section immediately. Her babies were born premature and were very sick. They couldn’t breathe on their own and had to be put on the ventilator immediately. They could not even feed. Their tiny bodies were covered with tubes that were keeping them alive. Despite all that their baby boy could not survive. Just 2 weeks after being born, he passed away, devastating Sravanthi and Raju. Now their only hope is their little daughter, and they are willing to do anything to save her life. Seeing one child die in front of her own eyes shattered Sravanthi. She can’t imagine her life without her daughter and constantly prays for a miracle to happen, that can save her little girl. But the hospital and treatment expenses are beyond their means. Raju has a small pharmacy in Karimnagar and makes a minimal income every month, to support the bare necessities of his family. 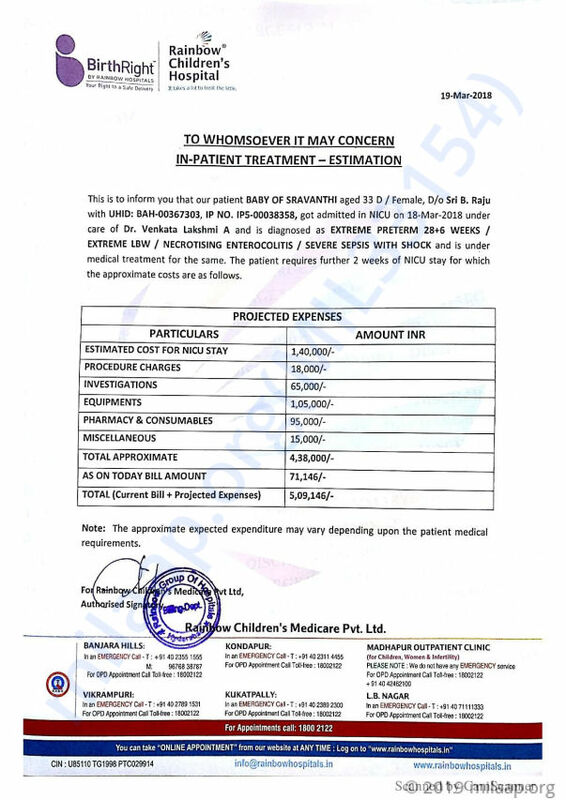 Over the last month, he has spent over Rs 9 lakhs towards the treatment of his babies. All his savings are exhausted and he has taken heavy loans from his relatives and friends to pay for the expenses. Now all his sources have dried up and he has no means to afford his child’s treatment. Saying no to treatment means losing the only child these parents can have. 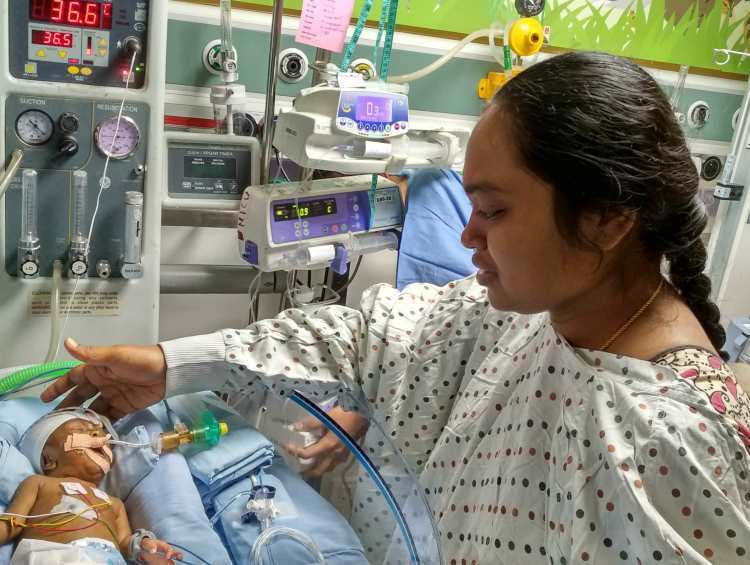 In order to save their baby, Sravanthi and Raju need your help. Only your contributions can save her and give them back their bundle of joy. Our baby succumbed to death due to severe liver infection. My wife was given antibiotics before she underwent C-section. We were hoping the infection would reduce and the babies would survive. But soon after the C-section, we noticed in the 33 days that our baby lived for, that her infection kept worsening. She also couldn't breathe on her own. We tried everything we could, to help our baby survive. We will be thankful to all of you for the rest of our lives to have given us those few days of being parents to our little babies. Also, we will be utilizing the funds raised for the bills we have incurred till now. Please keep supporting us.